Twenty years ago, we were a truly unique company. Today, a lot of companies provide outdoor adventure experiences as part of an “industry” that seeks to certify and regulate. We seek something larger that sets us apart from that industry. Since we are truly interested in quality throughout our lives we must demand more than mediocrity. What are quality experiences for our participants? What is quality in our company? How can our courses be as safe as possible? How can we maintain a high quality, fun, principled workplace? Rules, regulations, policies, procedures, and certifications are not the answer. They are only indicators of minimum expectations. They may serve protective functions but do little to support excellence. They define the floor but not the ceiling. We need a structure that supports all that we have to give and provides a framework for serious decisions to be made while supporting the flexibility that is required for making split-second decisions in the field. We need to establish a covenant among ourselves resting on people’s good will and commitment to a shared vision of a rich and compassionate life. Communicating, understanding and living the mission and principles of our company are the initial duties we have to each other. Members of the Mountain Challenge staff pledge full and faithful efforts to fulfill these obligations. Nothing less is acceptable. A model developed by George Leonard that defines what it means to be a master. We believe in the importance of the learning curve as we pursue our passions and in the importance of helping others up his/her own learning curve as we are able. A master is someone who pursues their passion for the joy of it and not someone who knows it all. A Costa Rican concept that defies the literal translation of ‘pure life’. Our idea is to ‘Have Fun’. The value of fun, passion, laughter, and joy is understated in today’s society. By embodying Pura Vida, the serious is handled better. A Patagonia, Inc. concept used to describe their clothing design philosophy. We think form and function are closely linked in all aspects of life – individually, physically, emotionally, corporately, etc. This philosophy addresses more than clothing design. By developing our understanding of our own “form” (likes, dislikes, preferences, passions), the clearer our “function” (calling, action, decision) becomes. Lala is the Hawai’ian word for sideways. In the world of surfing, going lala fundamentally changed the way surfers rode waves. Instead of simply letting the incoming wave push the riders forward and straight toward the shore, turning the board sideways into the face of the wave (the part that has not yet broken) allowed them to elicit a much longer (and safer) ride. By rejecting the most obvious and easiest path and refocusing the energy of one’s situation, individuals are able to increase efficiency, safety, and overall enjoyment. This is a core value of Mountain Challenge. Communicating, understanding, and living the mission and principles of our company are the initial duties we have to each other. The deeper implications of quality for Mountain Challenge have specific meanings. Our courses should be functional, accomplishing a clear objective for our client. Our work should be flexible enough to meet several goals in a variety of conditions. Our courses are simple and straightforward in their design and delivery. A quality experience with Mountain Challenge will provide life-long lessons. Our courses have integrity: that is we do and live what we teach. And finally, it’s fun. Our best courses are the most enjoyable. We hold ourselves to high standards in not just some but all of these. A course isn’t high quality if our clients like it, but our staff does not. It’s not good enough for us to teach something we don’t or won’t try to do. Sometimes participants correctly perceive our activities as dangerous. If people don’t feel safe, absolutely nothing else will take place. Providing the safest possible experience is critical. Safety transcends rules and policies. We think experienced staff making sound safety judgments leads to safe experiences. Two essential questions drive our safety judgments: What are the consequences of failure? What is the likelihood of failure? Knowledge of the objective hazards, subjective hazards, and the safety equation (strength + endurance + knowledge + skill) informs safety judgments. Safety judgments are on-going and include emotional as well as technical factors. A pillar of safety is the fitness level of our staff, each of whom need to be fit enough to make sound safety decisions at the end of a long day, as well as at the beginning, and to enact a rescue if the need arises. Finally, our safety policies describe minimum, required actions of our staff. Safety and quality are our bedrock first principles that inform all our decisions both in the office and in the field. While medical advances have led to increased life expectancy across the United States, Appalachia has not kept pace with the rest of the nation. A ‘health-gap’ exists between Appalachians and the rest of the country, with over half of that gap accounted for by smoking-related diseases . This is further exacerbated by a general lack of activity in our region. Nature-Deficit Disorder (NDD) is the term coined by Richard Louv that describes the cost associated with the contemporary disconnection between children and nature, where direct interactions with nature are being replaced with DVD documentaries or seeing nature through a car window. Children diagnosed with ADHD saw statistically significant improvements in their symptoms when exposed to green spaces . 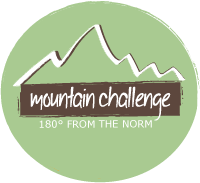 One of our greatest callings at Mountain Challenge is to address this issue by getting people out into the woods. New research has been conducted on the health benefits of being in, on, and around water. Dr. Wallace Nichols, the author of Blue Mind, describes a meditative state we achieve when working and playing with water. We are less stressed, happier, are more creative, have greater attention spans, and our breathing and heart rate decrease. Activities in water have the dual-benefit of exercise in this revitalizing state. In response to these revelations, we have adjusted our trips to include more time in and around water. Athleticism is part of our soul at Mountain Challenge. We know the delight and importance of sweat produced through physical exertion. We know the pleasure of watching a sunrise from a mountaintop achieved by human power. We know how much fun it is to see the countryside from a bicycle seat. We know how good athleticism and fitness are for us. Unfortunately, we also know how little is done to encourage youth to get outside. Today’s culture is enamored with digital zones. Mountain Challenge sees attempting difficult tasks in ‘analog zones’ as valuable in themselves. Thus, we ask our staff and our participants to Feed the Rat– A term coined by rockclimber/writer Al Alvarez that describes the inherent value of attempting difficult tasks. Additionally, we encourage each other to be active in the community in whatever way makes sense. Staff may donate Mountain Challenge experiences to groups they support if they are willing to personally provide the experience. As outdoor professionals, we have a responsibility to the environment as it is our workspace. We strive to practice the concept of ‘use without abuse’ in this unique workplace and aim to spread that ideology to our clients. Crawford House is a primary example of this philosophy. This facility is where we work and play, and we have spent countless hours ensuring that it represents how we feel about our workplaces. Repairs and renovations to the house include installation of a tin roof, programmed thermostats, a timed hot water heater, low flow toilets, reuse of decking material for the back decks, VOC-free interior paint throughout, and a switch to TVA’s GreenPower program. We care about the spaces we use, particularly the Maryville College Woods. As the largest remaining greenspace in the city of Maryville, we recognize the potential for abuse. We support the newly approved guidelines for using the woods, and we have committed to limiting the number of people we serve annually to help reduce the impact. As guardians of these woods, we take on the responsibility of ensuring that they are treated well. We have designated members of our staff as Woods Ambassadors, and it is their job to monitor the use of the woods to prevent abuse. However, the most effective tool we can employ to protect this greenspace is sharing our mission with members of the community, as we all have a vested interest in maintaining this unique area. Mountain Challenge is the primary advocate for healthy living on Maryville College Campus, and has also played a significant role in promoting fitness in Blount County. Through promoting programs such as Fit. Green. Happy.™, Camp 4, Exercise is Medicine On Campus(r) (EIM-OC) and All In. As well as through collaborative work with Maryville college faculty and staff, we are constantly encouraging and providing a framework for healthy living both on Maryville College Campus and the greater Blount County community. Every one of these objectives is dependent on the ability of our leadership and our staff to implement the spirit of our Covenant.